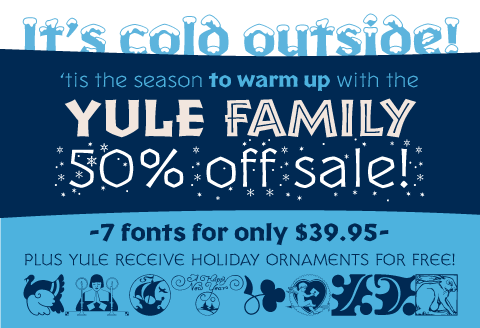 Yule Font Family Special- 50% Off the Yule Font Famuily plus bonus font. 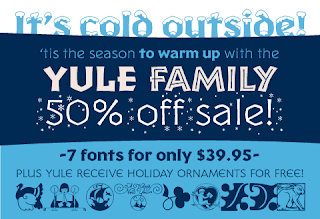 For a limited time only, we are offering the Yule Family of 7 fonts (reg. $79.95) for 50% off or $39.95! Plus, we are also including the LTC Holiday Ornaments (reg. $19.95). That's 8 fonts for only $39.95 (reg. $99.90). The Yule Family Special...just in time for your holiday and New Year's greetings. About These Fonts P22 Yule is a display font inspired by a melange of ancient inscriptional writing. It is exotic yet familiar and evocative of winter holidays. Its alpine look lends itself to the thoughts of chalets and fondue and includes two fonts that add flurries and heavy snow. LTC Holiday Ornaments is a set of 80 ornaments that has been assembled for those less commercialized holidays, including Thanksgiving. To learn more or to order this special, follow the link to the Yule Family Special page. This offer is valid through December 8, 2013 only. P22 type foundry and the Hamilton Wood Type Museum are pleased to present their latest collaborative digital font release via Hamilton Wood Type Foundry (HWT): HWT Van Lanen, by renown type designer Matthew Carter. Matthew Carter has had a long career as an innovative type designer. He received the 2010 MacAurthur Fellowship award, and in 2011, he received the Lifetime Achievement Award from the Smithsonian National Design Awards. Carter was trained as one of the last type designers to cut punches for metal type production. He has designed type for most technologies with the exception of wood type until 2009 when he was commissioned to create a new original type design by the Hamilton Wood Type Museum. Matthew Carter has created many notable type designs, including Georgia and Verdana for Microsoft specifically for on-screen web typography, which set a higher standard for web users. Carter's Bell Centennial was created for AT&T. This design featured narrower yet highly legible letterforms, which resulted in reducing a substantial number of pages per phone book and ultimately saving countless trees from the pulper. The design of the Van Lanen font for Hamilton presented a new challenge for Carter: the font was to be cut using 100+ year old technology that has its own set of unique limitations. The final design presented by Carter features a two-part font that echoes the historic 'Chromatic' wood types, which take advantage of color overlays. The font was cut for demonstrations and offered for sale as a new wood type design via the museum. Even though the Van Lanen fonts have been cut and made available, contemporary wood type production is still relatively expensive and few have actually acquired this font in wood format. The HWT digital release will allow typographic aficionados, graphic designers and casual desktop publishers to use the new Carter design for all digital uses. 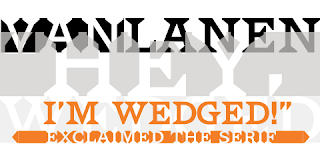 HWT Van Lanen is available at an introductory discount through November 30th. Purchase the set of 2 fonts for only $29.95 (reg. $39.95). As with all of the HWT digital font releases, proceeds will help support the museum's operations and its mission of hands-on education and research. For more information regarding this release, check out the Hamilton Wood Type Foundry website. See our Behance page for photos and more background info on the development of the Van Lanen font from wood type to digital. Matthew Carter has had a long career as an innovative type designer. He received the 2010 MacAurthur Fellowship award, and in 2011, he received the Lifetime Achievement Award from the Smithsonian National Design Awards. Carter was trained as one of the last type designers to cut punches for metal type production. He has designed type for most technologies with the exception of wood type until 2009. His most notable font designs, among others, include Verdana and Georgia, specifically designed for web browsers and Bell Centennial for the US telephone directories. This design featured narrower yet highly legible letterforms, which resulted in reducing a substantial number of pages per phone book and ultimately saving countless trees from the pulper. Carter, now a principal of Carter & Cone Type Inc., has also been commissioned to produce type for Time, Newsweek, Wired, U.S. News & World Report, Sports Illustrated, The Washington Post, The Boston Globe, The Philadelphia Inquirer, The New York Times, BusinessWeek and other institutions.